I've started working on mobile application, which can offload computationally expensive code to cloudlet and get the result back on mobile application. Please guide about the depend-abilities how to apply the task? Which cloudlet environment should be used and configure the cloudlet.Will be thankful if any one can help. I think the best way to get started would be to look at the README for the elijah-openstack project (https://github.com/cmusatyalab/elijah-openstack). If you follow the steps there, you should have an OpenStack environment running our cloudlet extensions. From there, you can follow instructions from the elijah-provisioning README to create a Base VM image and an overlay that has the backend server component of your mobile application running on it. You can then synthesis an instance of this VM from the Cloudlet panel in the OpenStack dashboard and once you have assigned that instance a floating public IP, you should be able to have your mobile application talk to it. I realize there is a lot of information there so I will try to break it down a little bit and if you have any other questions feel free to ask. The elijah-openstack project mainly consists of a plugin for OpenStack (currently we are using the Kilo release) that introduces a Cloudlet panel and the associated functionality. Hopefully there is enough here for you to get started. Let me know if you have any other questions. Thanks for Your Response. I'm configuring the environment, will let you know once done with configuration. Can you please help, how to perform this step. I'm stuck at this step. Step 5. Configure the Ansible script. Ensure the variables defined in roles/openstack-controller/vars/main.yml and roles/openstack-compute/vars/main.yml are satisfactory. Specifically you should ensure that the interfaces defined by pub_iface and flat_iface are valid. pub_iface is used by the physical machine to reach the internet. flat_iface is used by OpenStack in order to communicate with the virtual machines running on the host. If you only have a single network interface, make sure that flat_iface is something unique as a virtual interface with that name will be created when the one_nic variable is True. Does the physical machine you are installing on have a two network interface cards? If so, specify one to be used as the flat (internal VM communication) interface and the other for the public (i.e. access to the internet) interface. 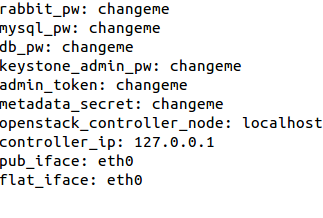 If your machine only has a single NIC, then just choose a unique name for the flat interface (something like veth1) and the Ansible script will create a dummy interface for this purpose. OpenStack prefers to have to networks, one for inter-VM communication/management and the other for public/internet connectivity. Hi teiszier my machine has one NIC. I'm stuck at this point, Cursor keep blinking at point " install library using fabric"
You should change your variable flat_iface to something other than eth0. Since you only have a single NIC, this can be anything, but it should be distinct from eth0. Try 'eth1' or 'veth0'. The likely reason that it is stuck on this step is because you did not properly specify the local user/password for the installation of elijah-provisioning. In 'roles/cloudlet/vars/main.yml', there are variables for a local user and password. These must correspond to an actual user and password on your machine so that the fabric installation will work. I realize this is not the ideal solution for an automated script like Ansible, but I didn't want to pull all the steps out of fabric and convert all that work into Ansible tasks. So this username/password is necessary for the installation via fabric as the script from the elijah-provisioning repo expects it to be installed by a user and not root. Hi there, please allow me to ask a question about installation. When I installed the Openstack++ by following the README. I encountered several issues. Please see below. 1. At the first time, I forgot to be the root user and I use "sudo" run all commands, but then I found it and used the root user to re-install all stuff by following the README. 2. When I got this error, I did try to re-install the whole thing by using the ansible-playbook command above 2 or 3 times. 3. I checked the folder "/root/.ansible/cp/", and found it is empty. When I installed 14.04 along with 18.04, the network service didn't install well due to dual systems, so I installed an extra network driver from Intel. Any suggestions or tips will be appreciated! Do you think I have to re-install Ubuntu 14.04 LTS and do everything again? I just re-installed my Ubuntu 14.04LTS and did the fresh installation again. I am guessing the reason is that I even didn't set up any connections so it cannot be reset? If not, does it matter? Thank you! If you launch the playbook again it should continue on past that step since you will be using a fresh SSH connection. You can also constrain it to that roles by using '--tags gateway' when you launch the playbook. This will skip all of other roles (openstack controller/compute, etc) and only perform the steps for the gateway role. This can be ignored. This is because you must've already run this portion of the playbook before and when you attempt to give privileges to a user that it already has, OpenStack returns a 409 and I instruct Ansible to ignore that error and carry on with the steps. This also explains why you no longer saw it on a fresh install.